Federal spending dedicated to children represents just 7.83 percent of the federal budget in fiscal year 2016 and total spending on children’s programs has decreased by five percent in the last two years, according to Children’s Budget 2016, our signature annual publication. The federal government makes more than 200 distinct investments in children. These include traditional children’s initiatives like education and child abuse and neglect prevention. They also include other investments that improve the lives of kids, like Medicaid and the Supplemental Nutrition Assistance Program. Children’s Budget 2016 offers a detailed guide to federal spending on children and an invaluable resource for those seeking to improve the lives of America’s youth. 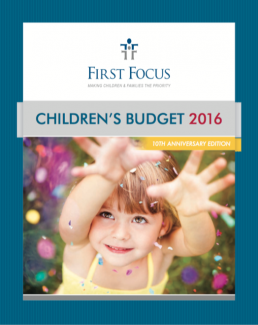 View the Children’s Budget 2016. View photos from the event via Facebook, browse the presentations, and watch video of the speakers via YouTube or Periscope.